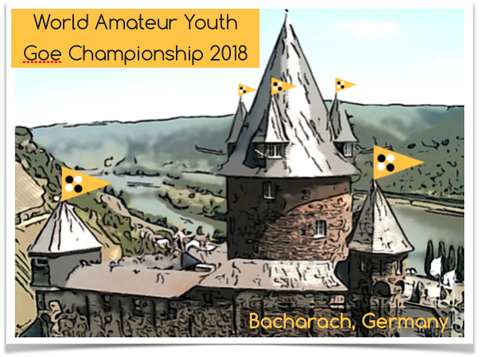 Jugend WM / World Youth Goe Championship 2018 in Bacharach - euro-go-kidss Webseite! In July 2018, the best kids from all over the world will come to Germany to play the World Championship! We welcome our guests from around the globe to Stahleck Castle in Bacharach on top of the Rhine river, a United Nations World Heritage Site. We will have lots of exciting games, but also lots of fun activities in and around the castle. The best German Go playing kids will be there, too, for a summer camp. Two professionals (Yoon Youngsun, 8p, Korea, and Hayashi Kozo, 6p, Kansai Kiin, Japan) as well as Kim Youngsam, 8d, Korea, Open European Champion 2012 and 2016, will be there and give game reviews or lectures. More information, the list of participants, photos and results will be posted here on this page.